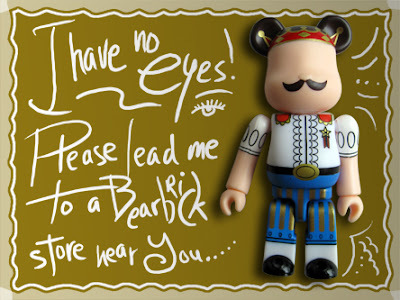 bearbrick love: where can i find be@rbricks? Guys, can you help me – Carrie, Dominique, Sunny, Fiona, Jake, Stu, Johny, Lil Lam, Erueti, Littleoslo... everyone out there! People have been e-mailing me, wanting to know where to buy Bearbricks in Asia, the US, Europe, Middle East, South America, etcetera. E-mail me at acomia@pldtdsl.net or simply comment on this entry – thank you very much! located in europe, but shipping worldwide !!! full of designer toys and especially be@rbricks !!! I am a bearbrick collector from Hong Kong. Here comes with the website of the toy store in HK, where can buy bearbricks. But some of them are in Chinese. Anyway, hope this is useful for u. - map is under "contact us"
Please visit the site for the address and contact number of each of the outlets. Please visit my Flickr Page for the photos of our outlets. I wouldn't recommend anyone buying from Action City. I have had an unpleasant experience with them and needless to say their staffs weren't friendly or too informative. In fact my two other friends blogged about their dissatisfaction about the attitude of the owner/boss. I just read your comment and the forum. Some how some of his comments reminds me of that Seinfeld episode "No soup for you!" I tried Toy Tokyo in the US. Never got my order and no refund after 20 mails, real assholes! one more recommended toy shop from hk that cannot be missed! "Naughtyguy". Address: Unit 1617-1619, 16/F, CMTA, 1 Sai Yeung Choi Street, Mong Kok, Kowloon. Is there any stores in Korea?? Thanks for these addresses, guys! :-) Any more? did you get my email/s? i had been to Taiwan, no good shop for bearbrick at all. Bearbrick in toy shop is crazily expensive and not up-to-date. I also asked my Taiwan friend, he said they get bearbrick from yahoo auction or ebay, which is the cheapest way to get from. Reader Stephane emailed me a list of Bearbrick stores in Korea and I'd like to share them with you. :-) Thanks, Stephane! in singapore there's a toy shop in far east plaza call Earthx toys & collectible, they sells a lot of bearbrick visit their website at http://www.earthx.com.sg. they send worldwide. My location is Los Angeles, California. hey i know a place where you can get bearbricks. there is a comic book shop in doyelstown pa called Cyborg One and its location is on 44 E state St, Doylestown, Pa 18901. so if any of u live in pa this is the place to go! hi! any stores in AUS??? www.wellgosh.com have just put up the Series 17 Be@rbricks aswell as the Kim Songhe, Skull The Fifths 400%! anybody know of any in seattle? Naughty Guy in Hong Kong had moved to a new place. Here's their new address and their showcase FYI. action city in city square , johor ,malaysia. the store can pre-order bearbricks which have not been released yet for the customers!! anybody know any in the philippines? Secret Fresh along Ortigas Avenue, near the corner of Santolan St. Going to QC. Hi, I am going to bangkok soon and im just wondering if there are any stores there that sells them at a reasonable price.